Have you ever played a deck building game and wondered to yourself if the format could be translated to a video game? Well, wonder no longer because Slay the Spire has come to answer that oddly specific question. 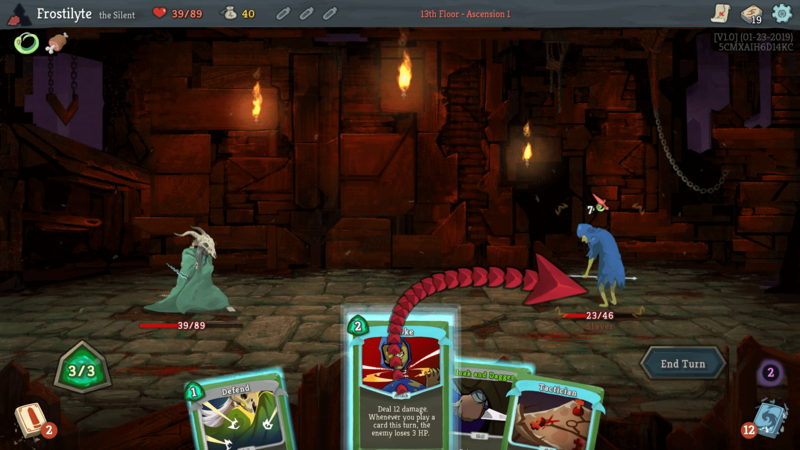 Slay the Spire sees players crafting a deck of cards containing various attacks, and abilities as they climb to the peak of the eponymous spire. The game also features rogue-like mechanics to add variety to each run preventing repetition, or conquest through formulating optimal strategies. The marriage of these two sets of mechanics works well and makes for a thoroughly engaging game. As you climb the spire, you'll be presented with a map containing various icons. Each of these icons represents what challenge lies ahead on that floor. Most of the floors are clearly labelled as a fight, a shop, or a campsite to rest at, but there are also floors tagged with a question mark. These floors can contain one of the previously mentioned encounters but have a high chance of being a text-based event where players make risky choices. Often times the most rewarding option available will have both a positive and negative clause. You may wish to gain a relic, an item with a powerful passive ability, but it comes at the cost of adding a negative curse card to your deck. It's not all bad, as any chance players are willing to take will result in a reward, so the game becomes more about when and what you're willing to take a chance on rather than always taking the safest path. 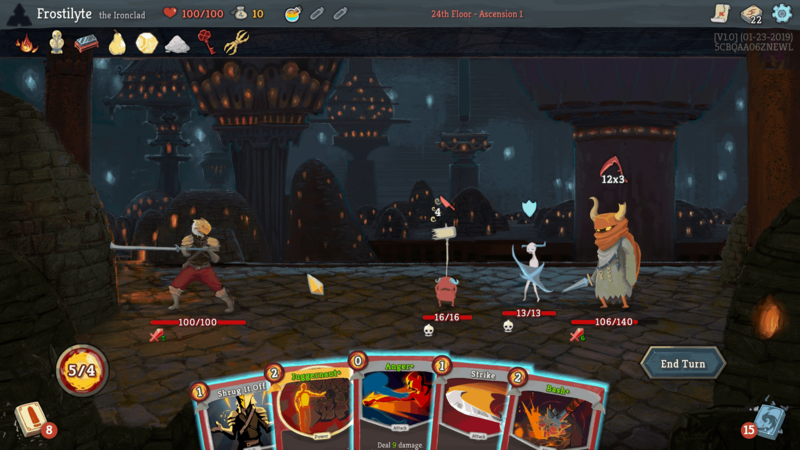 Along with encouraging players to gamble as a means to keep the game interesting, Slay the Spire also applies randomness to which cards are available each run. 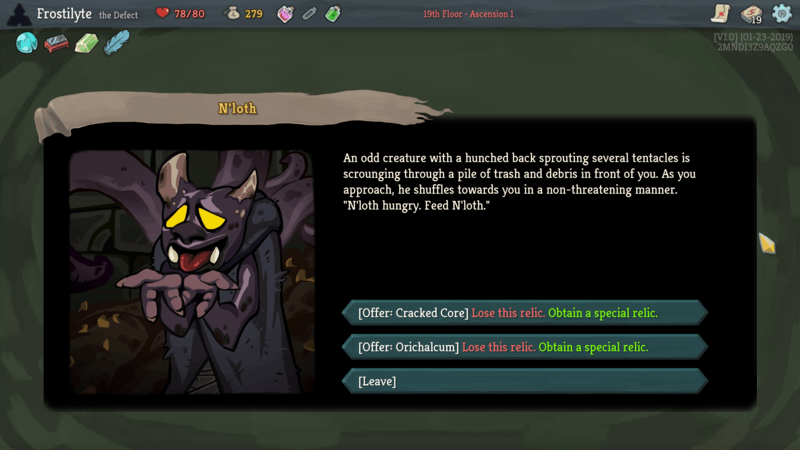 Each of the three character classes have unique cards, but within any attempt of the spire, you'll find cards in different volumes. 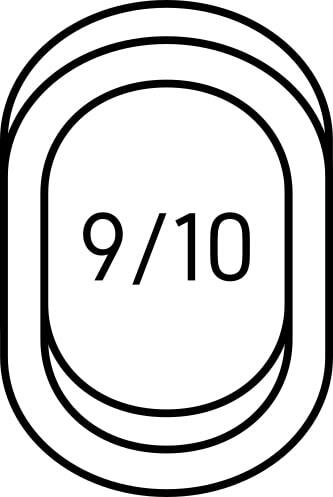 In some runs, a card may be too common, while in others it can be absent. This forces players to learn new strategies and card combinations rather than settling into a familiar rhythm and sticking to it. 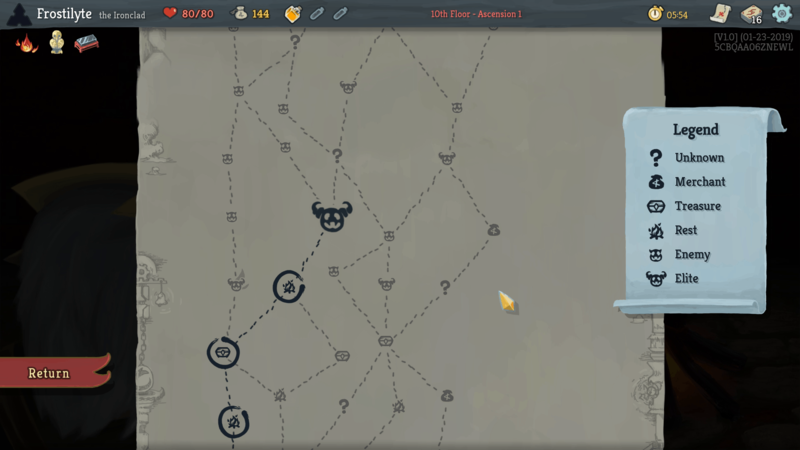 By doing this, MegaCrit helps to encourage variety and experimentation across repeated runs, which results in Slay the Spire being a more engaging experience. The linchpin for why this works so well comes from how the cards are designed. Instead of having many cards that explicitly rely on other cards, the roles and abilities of each card type are broad enough to allow for numerous functional combinations. Experimentation is encouraged as you'll find exciting new ways to utilize familiar cards with cards you've never used before. This system also alleviates frustration when players don't get the one specific card they needed. With so many cards, and relic combinations completely new strategies can be born from players being forced to critically consider all of their available options rather than becoming dependent on old mainstays. While the variety of cards and relics provide a large amount of variety, it is important to note that it is never overwhelming. Were everything unlocked from the start of the game there would be hundreds of cards for players to learn. 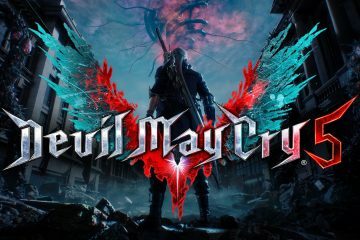 In an act of mercy, MegaCrit has prevented overwhelming the player with options by slowly introducing new content after each run. Players start with only one of the three playable classes and about half of that class' cards. As you continue to play the game more cards, relics, and the remaining classes will be unlocked. This has the potential to feel like a grind but worry not as the base cards for a class are perfectly capable of completing a full run. The card unlocks provide more variety rather than objectively stronger cards, so your ability to complete the game is linked to your own skill rather than unlocking the most powerful cards. And if that wasn't enough variety for you, there are also custom game modes. Every day a new daily climb is made available. This mode features a custom game where different modifiers are in play and all players compete on a leaderboard. There is also a custom game mode where players have the ability to tailor their own custom games. 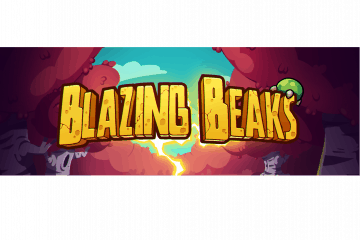 Some of the stipulations available make for hilarious results, making this mode a thoroughly enjoyable alternative when players tire of the standard game mode. It's also worth mentioning if you're on PC, you can mod the game for even more options. Another big win for Slay the Spire is how it communicates information to the player. While fighting in combat, an enemy's intention will be listed over their head. You'll know which enemies are planning to attack, and how much damage that attack is going to do. You'll also know when enemies are planning to cast a buff or debuff. Having this information clearly communicated to the player means they can consistently make strategic decisions about how they should play. There is no guesswork involved, so your own tactical abilities are what result in success rather than luck. 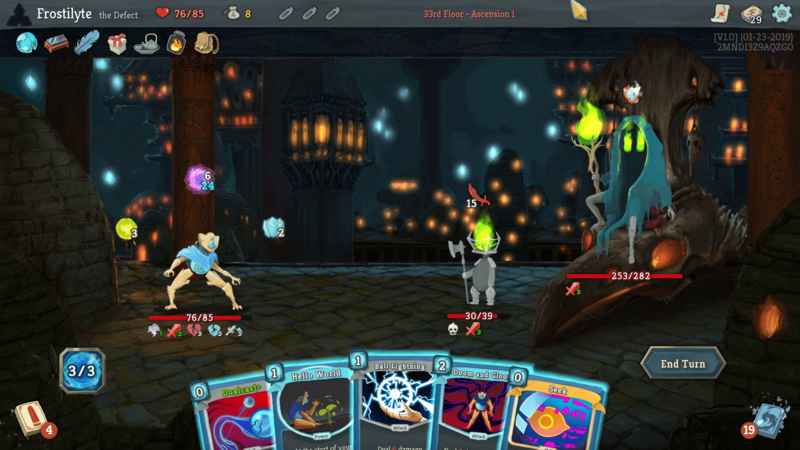 The one major criticism I have against Slay the Spire comes from the art style. 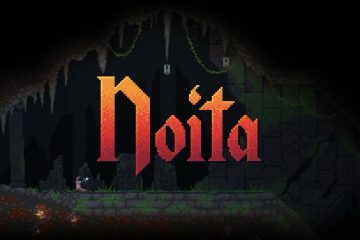 The visuals feel flat and lifeless, making the characters and enemies look unappealing. The basic attacking animations where characters jerk forward don’t help either. While the basic aesthetic works well for the cards, which is admittedly important, I'm not a fan of it on everything else.